Roy Bean was born in Mason County, Kentucky in about 1810. He moved around as a young man and for a while lived in Mexico. In 1825 he was accused of killing a man in Chihuahua. Soon afterwards he served a month in jail in San Diego after killing a man in a duel. During the American Civil War, Bean, a supporter of the Confederate Army, led a guerrilla band called the Forty Rovers. This group, based in San Antonio, was commonly known as the Forty Thieves, and it was claimed that Bean was more concerned with robbery than with fighting the Union Army. After the war Bean became a trader and eventually took over a saloon in Vinegaroon. The tent town was built for railroad labourers and developed a reputation for wild behaviour. In 1882 Bean was appointed as the town's justice of the peace. With the support of the Texas Rangers Bean attempted to maintain law and order in Vinegaroon. Unless he was paid a bribe, people convicted of crimes in Vinegaroon, were treated very harshly. When an acquaintance was charged with killing a Chinaman, and after studying his law book Bean claimed he could not find a passage where "it says it's illegal to kill a Chinee". The man then paid a bribe and he was acquitted. On another occasion Bean fined a corpse $40 for carrying a concealed weapon. 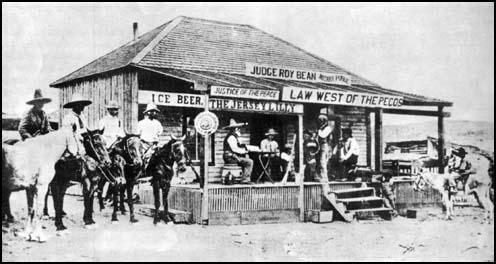 Bean moved on to Langtry where he became the owner of the Jersey Lilly Saloon. He soon got himself elected as justice of the peace and continued to make a good living from his activities. This included $4 for presiding over weddings and divorces and $5 for officiating at inquests. His marriage ceremonies always ended with the same pronouncement used when condemning men to death: "May God have mercy on your soul." 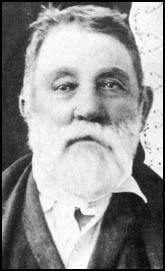 Roy Bean died in 1903. You have been tried by twelve good men and true, not of your peers but as high above you as heaven is of hell, and they have said you are guilty. Time will pass and seasons will come and go. Spring with its waving green grass and heaps of sweet-smelling flowers on every hill and in every dale. Then sultry Summer, with her shimmering heat-waves on the baked horizon. And Fall, with her yeller harvest moon and the hills growing brown and golden under a sinking sun. And finally Winter, with its biting, whining wind, and all the land will be mantled with snow. But you won't be here to see any of 'em; not by a damn sight, because it's the order of this court that you be took to the nearest tree and hanged by the neck till you're dead, dead, dead, you olive-colored son of a billy goat.